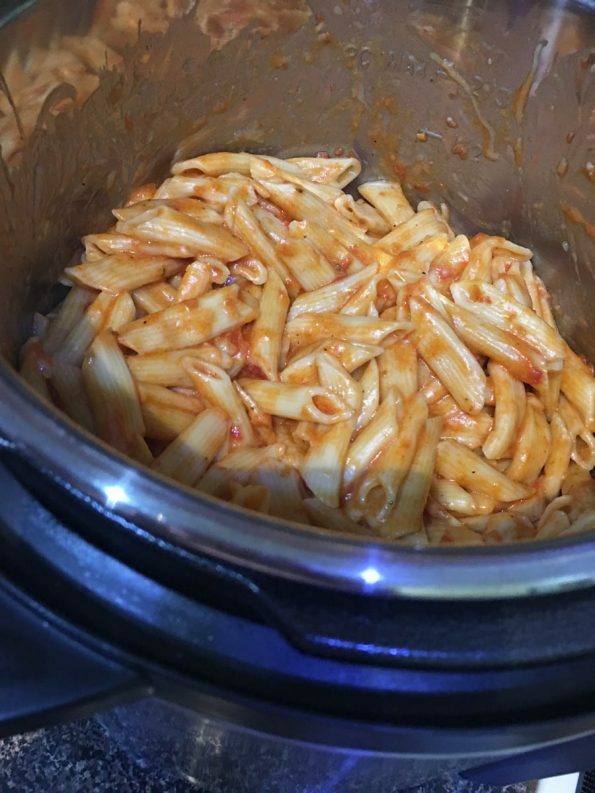 This is basic instant pot one pot pasta recipe with added marinara sauce and some cheese and will help you to learn how to cook pasta in instant pot. Nothing fancy here, just the basics of cooking pasta perfectly in the instant pot! We first make plain pasta in instant pot with little salt, olive oil and butter and then add marinara sauce and cheese to the cooked pasta which makes it so simple to prepare yet very quick and delicious with minimal work to do. While I mostly used the penne pasta to make the pasta in this way, I also used bow tie pasta/farfalle pasta (butterfly shaped) and also spaghetti (for spaghetti I used a different measurement for water to pasta ratio). See instant pot spaghetti recipe here. Keep in mind that the amount of water used may slightly vary with different kinds of pasta shapes as well as different brands as even the flour used to make the pasta can have an impact on the cooking time and also the amount of water absorbed by the pasta. 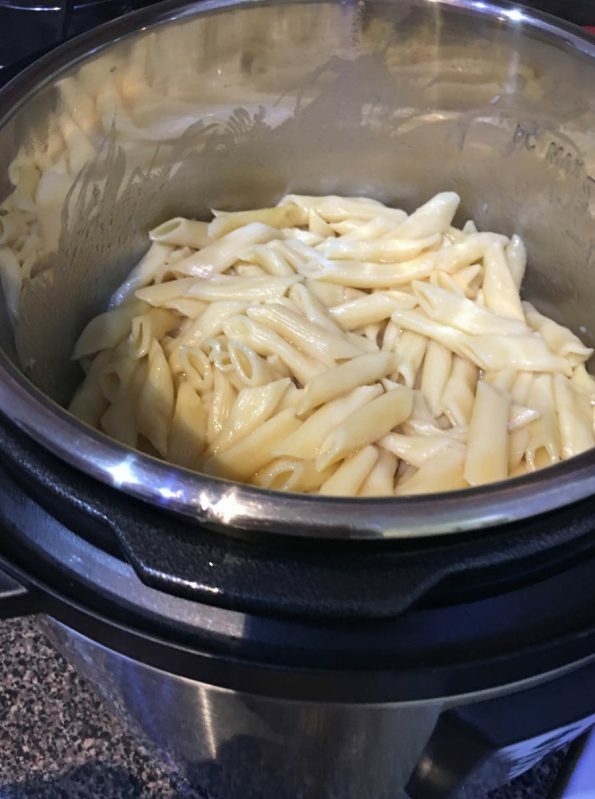 For this instant pot one pot pasta recipe, I have used quite a different varieties of pasta successfully so I can recommend this method as a general guidance for easily cooking plain pasta using instant pot. 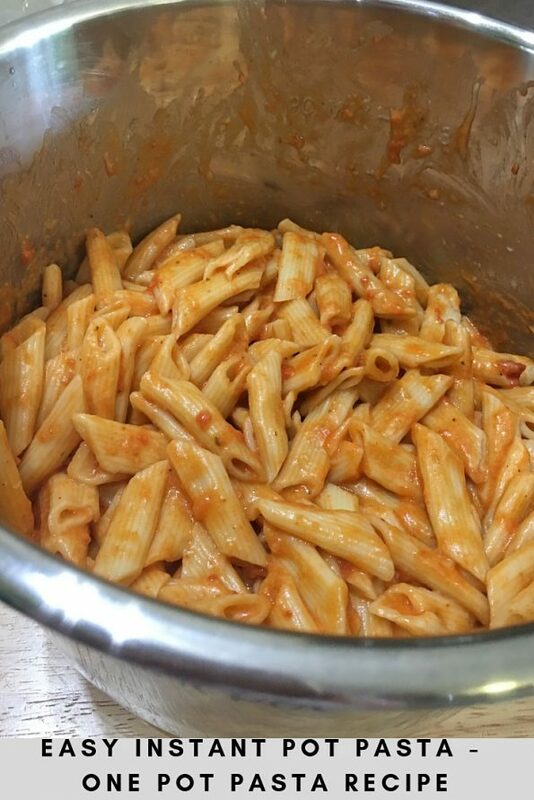 To be specific, I successfully I tried using the 16 oz penne pasta and also the 16 oz bow tie/farfalle pasta all from the Barilla brand and they turned out great. 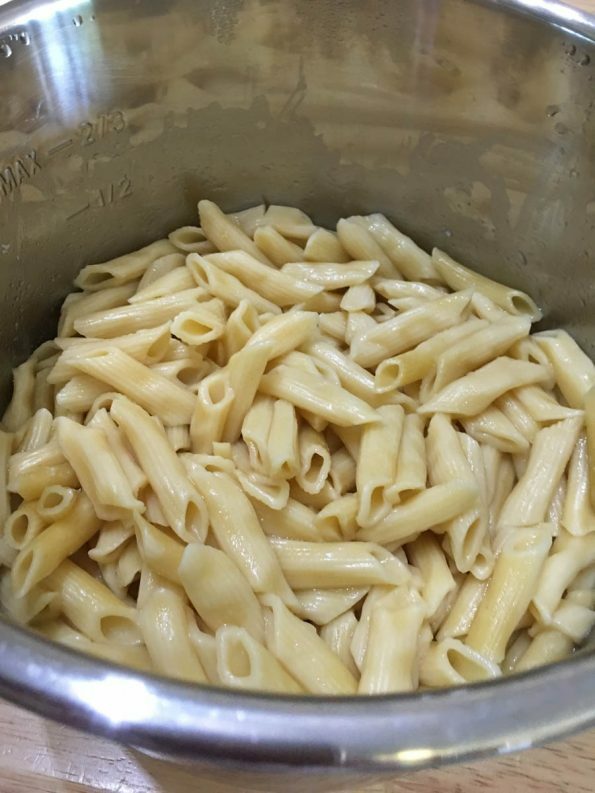 A 6 quart instant pot is perfect to cook this amount of pasta as mentioned in the recipe. We do not have to drain the pasta using the instant pot method, so nowadays I almost always cook pasta using my instant pot, unless there are specific recipe requirements where I have to do it the other way. While you learn to cook the past using instant pot, the biggest advantage is that yo do not have to drain the pasta once it is cooked, since we only add enough water in the instant pot which will all get absorbed while the pasta gets cooked. But don’t worry the pasta won’t be mushy or overcooked as we only use just enough water for cooking and also we cook only for the minimum amount of time in the instant pot, to avoid the pasta getting mushy or overcooked. It is also important to add the fat (I used a combination of butter and olive oil) so the pasta shells won’t stick together once it is cooked. In fact we only cook the past for 3 minutes in the instant pot for this basic instant pot pasta recipe which is just enough to cook the pasta. Instant pot pasta dishes are the quickest and best if you are looking for quick and easy one pot dinners and this is the best method to cook pasta which I know so far! 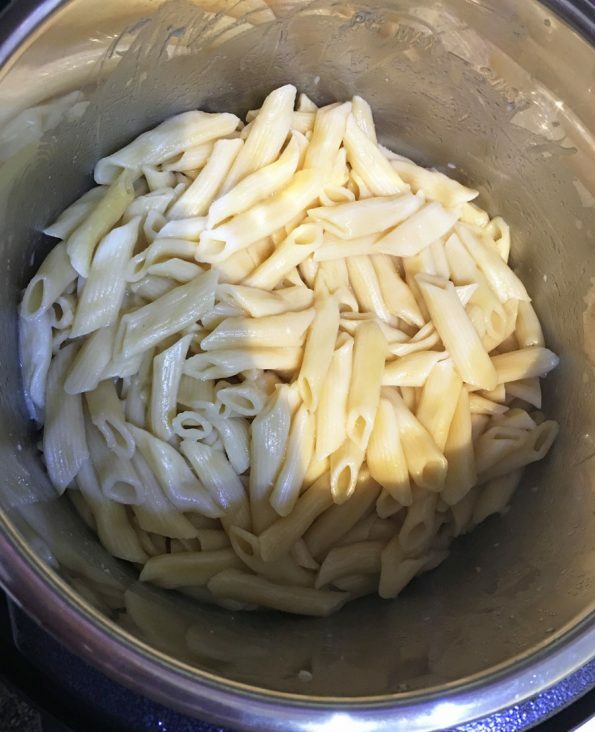 I used 6 quart instant pot to cook this amount of pasta as called in the instant pot pasta recipe below. The instant pot pasta water ratio and time we take to cook the past in instant pot are very important since it can be a messy failure if you use a different amount of water of different total time for cooking. 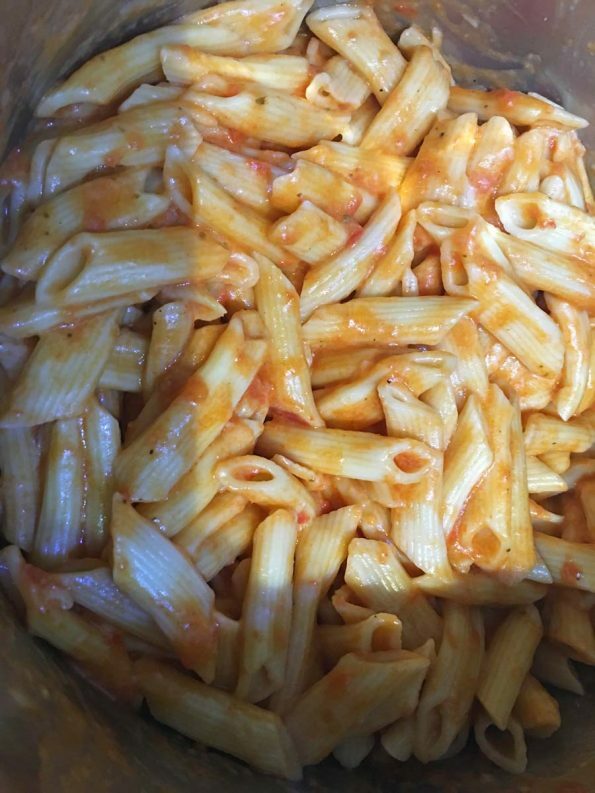 The instant pot pasta water ratio I have used in this instant pot pasta recipe using the penne pasta or bow tie/farfalle pasta here is 16 oz pasta shells:6 cups water (for 3 minutes of cooking in high pressure and natural pressure releasing method). If you wish to convert the amount of pasta used from oz to cups, the 16 oz of uncooked pasta is about 4 cups of uncooked pasta. If you want a more firm consistency, you may also slightly reduce the amount of water, but make sure not to use even a little more amount of water than the recommended 6 cups since using more water will make the pasta overcooked. Also the amount of water may slightly differ based on the brand or shape of pasta shells that you are using, so a basic rule that you need to remember is to use just enough liquid to cover the pasta in the pot, but not more than that. 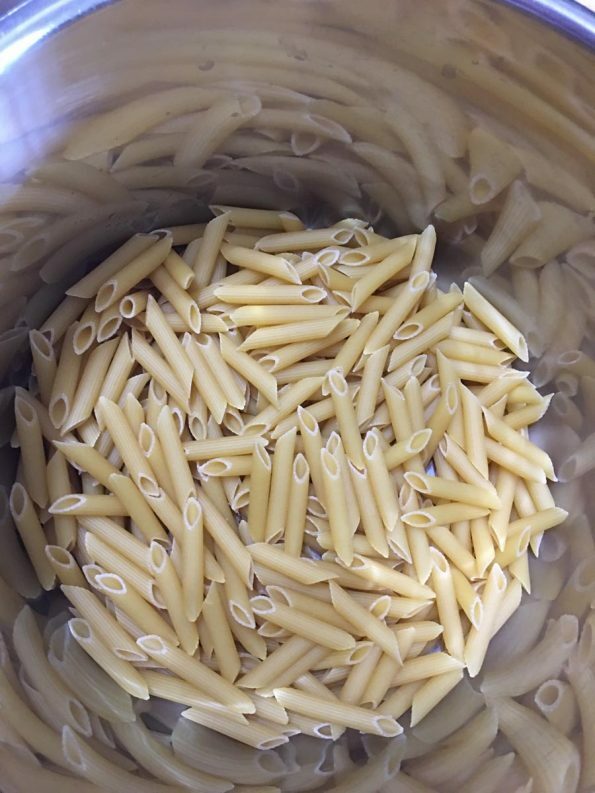 In brief, the amount of liquid should be just above the pasta level, but not more. Here we are only using water for the liquid part, as we are adding the marinara sauce later once the pasta is cooked. 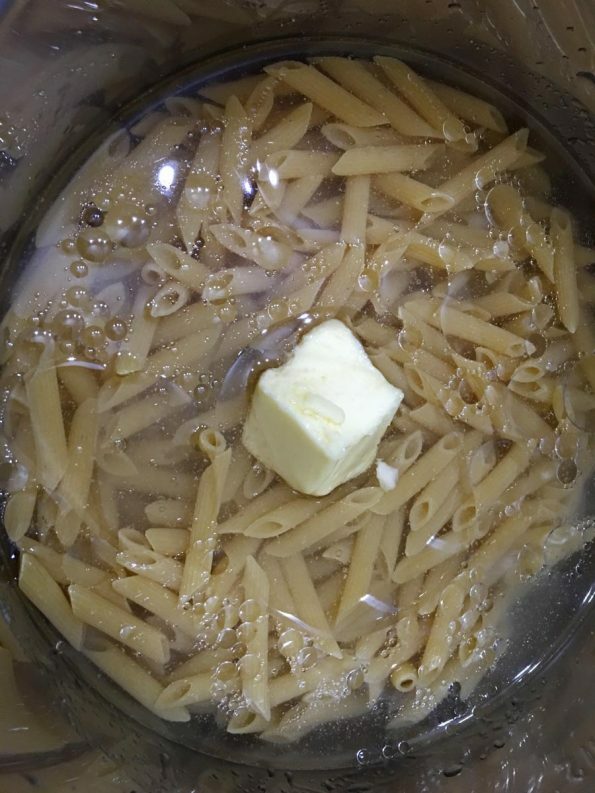 To me, using 6 cups of water for 16 oz of pasta shells and pressure cooking in high for 3 minutes with a little salt, olive oil and butter gives the perfect instant pot pasta. 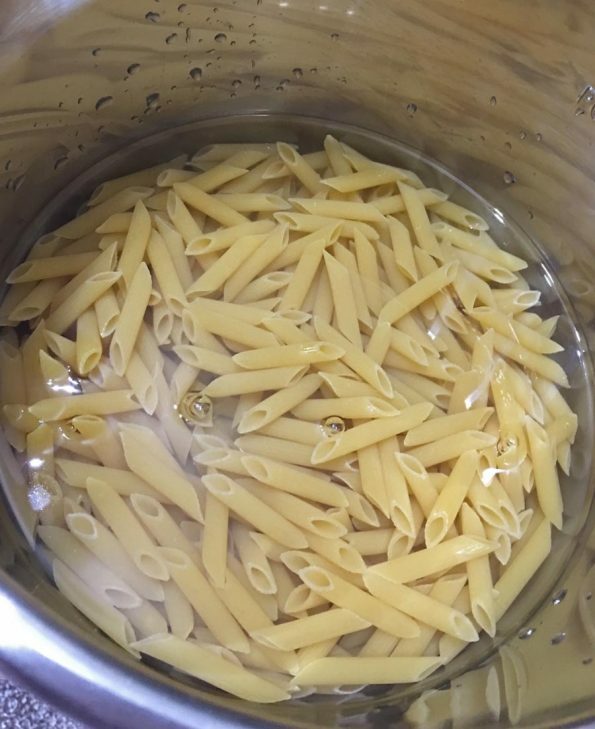 As I mentioned, I tried this method for pasta to water ratio in instant pot for farfalle pasta as well as penne pasta and they turned out perfect. Also we only use the natural pressure release method (instead of quick release) and for this amount of water and pasta ration, natural releasing method is just perfect! If you change the amount of time for cooking and also do not do natural pressure releasing method, the amount of water required can change. 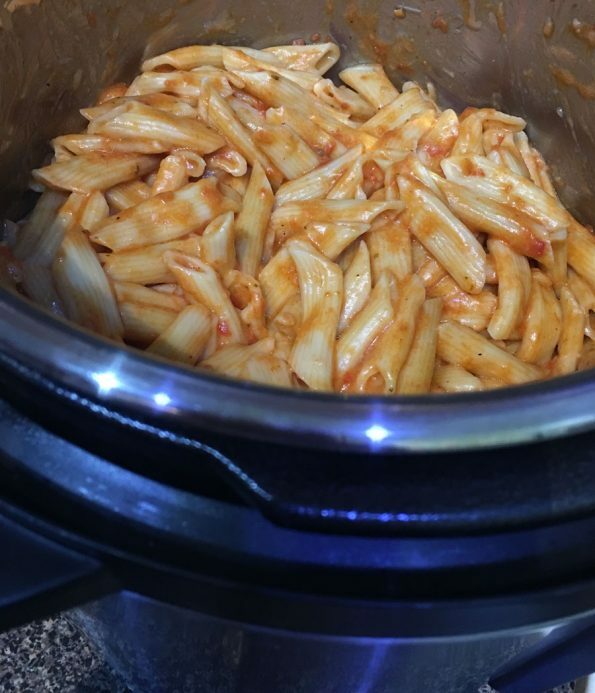 See this easy instant pot pasta soup recipe here where we quickly make a delicious instant pot pasta soup with marinara sauce. So here is how you can make easy instant pot pasta using this basic and easy instant pot pasta recipe. Try 16 oz farfalle pasta or penne pasta to make this easy instant pot pasta. 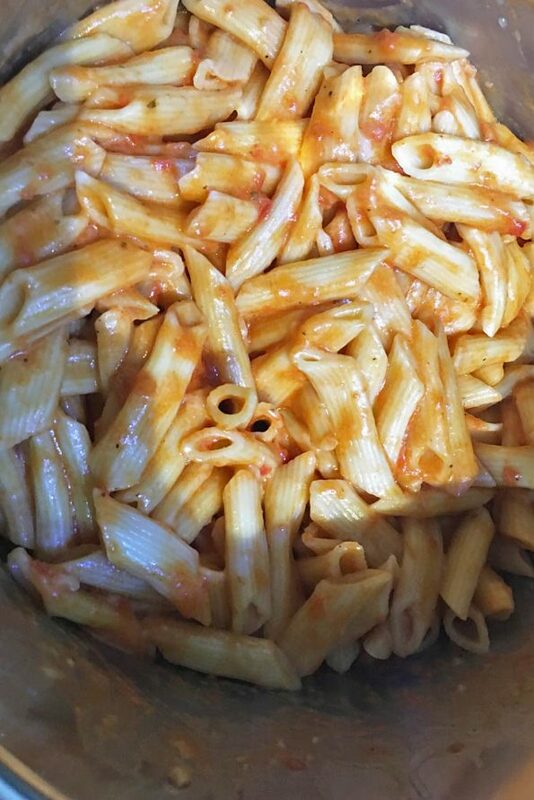 This marinara sauce is perfect to make any pasta delicious and you can use it in this easy instant pot pasta recipe as well. 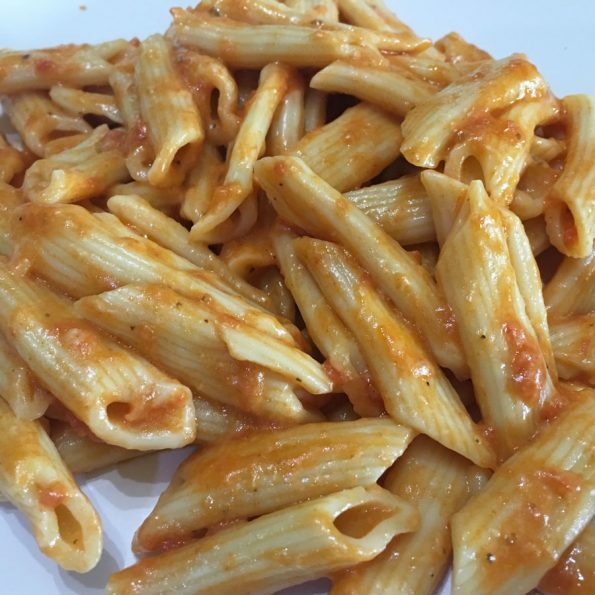 Easy, delicious instant pot one pot pasta using penne pasta with marinara sauce and cheese makes a quick one pot lunch or dinner. You can try bow tie pasta shells also with the same method and ingredient ratio. Add the pasta shells, water and salt to the inner pot, mix well. Add 2 tablespoons of oil and butter also to the pot and stir well. Close the instant pot with lid in sealing position and plug the instant pot. Press on manual and pressure cook on high for 3 minutes. It will take a few minutes for the pressure to build up inside instant pot and once the pressure is built (which takes a few minutes and it will show 'On' until then) the count down of the minutes (here 3 minutes) will start and it shows the number of minutes left for cooking. Once the cooking is finished, the pot will beep and you press the 'keep warm' button and wait until the pressure is naturally released and the valve goes down, which will take another few minutes of time. You can carefully do a manual release after 20 minutes of NPR (natural pressure release) if needed. Once the pressure is naturally released, unplug the pot and open the pot by turning the lid on to the venting position, and see if the pasta is cooked and soft and if there is enough salt. Add the garlic powder and marinara sauce, stir well to combine with the pasta. Makes sure to using a good quality spatula to gently mix in the pasta and also avoid mixing it overly. Add the shredded cheese and stir again to mix in with the pasta. If you wish, you can also add one more tablespoon of olive oil and stir in gently which will add even more flavor to the pasta. 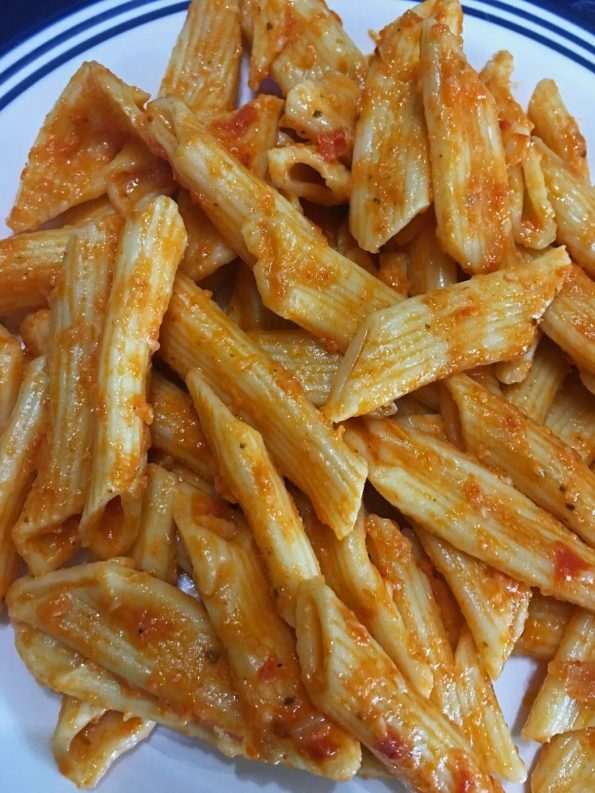 Serve the pasta hot for a delicious lunch or dinner! 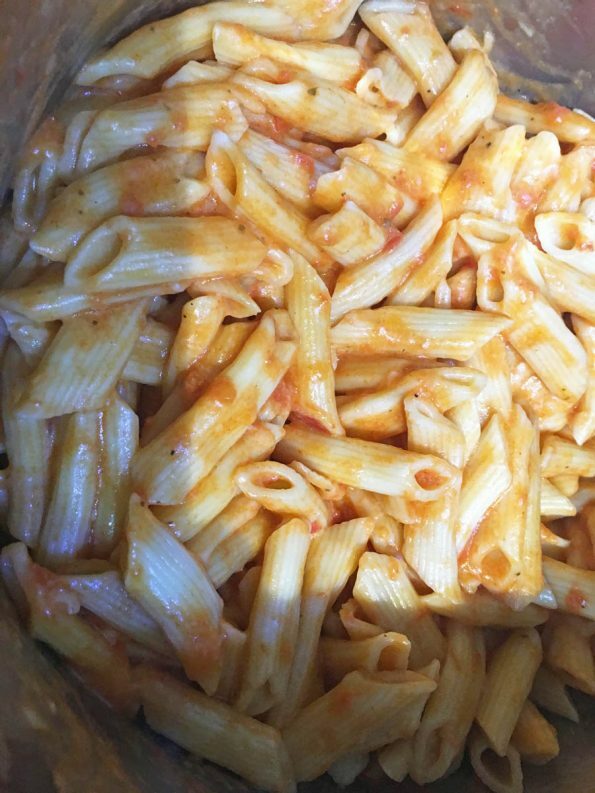 In any case if there is any little liquid content left on the pot once the pasta is cooked, you can add an extra tablespoon of olive oil, give a gentle stir and keep it aside for another few minutes and the liquid content should be absorbed as the pasta cools down, while each pasta shell will still remain intact and not getting mushy or overcooked. 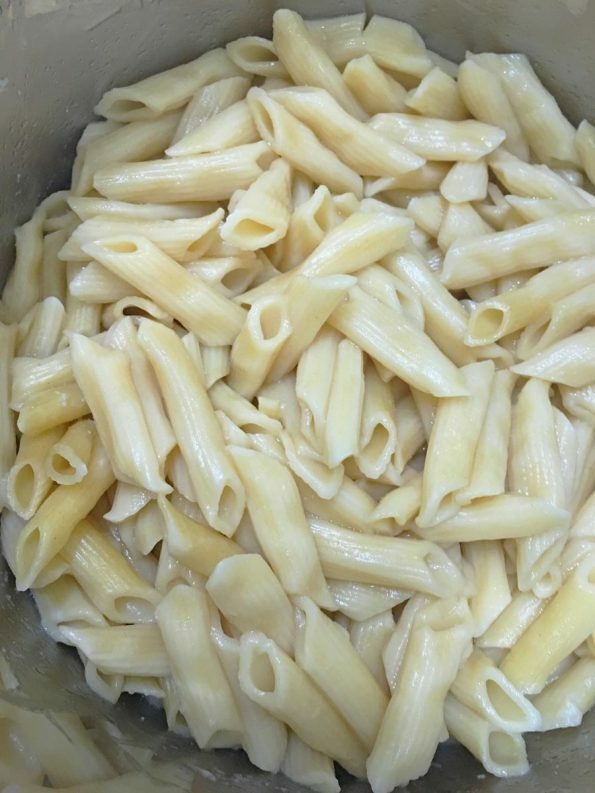 Once the pressure is all naturally released, do not leave the pasta unattended in the pot, but open the pan immediately after the pressure is all naturally released and gently stir the contents. If any liquid is remaining, refer the above notes. You may adjust the amount of water a bit based on the brand of pasta, the kind of pasta shells used and also your preference over the texture of the cooked pasta. If you want a more firm texture to make pasta salads, you may reduce the amount of water slightly. Make sure to add the sauce and cheese only after the pasta is cooked while following this method, as mentioned in the recipe. 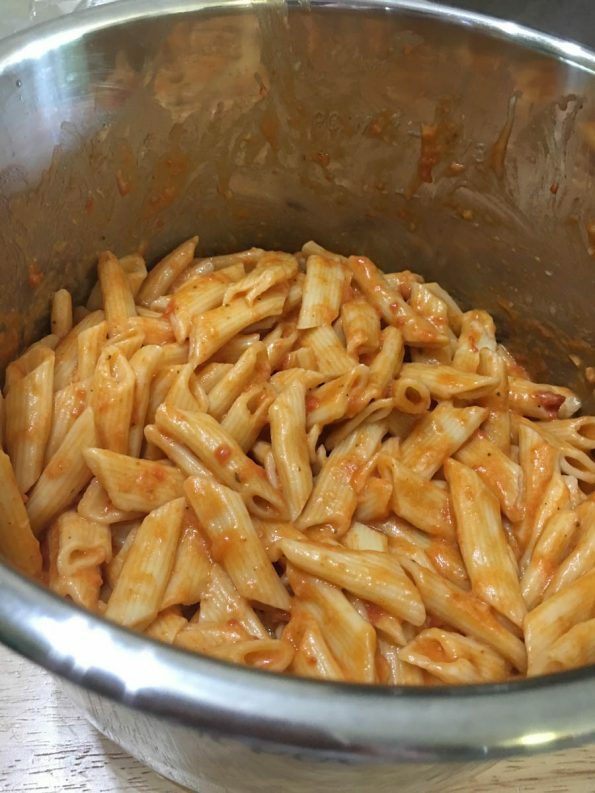 Hope you found this post on simple instant pot one pot pasta recipe helpful in making easy, quick and delicious one pot pasta using instant pot.